On 14th & 15th September, Celloglas exhibited at Packaging Innovations 2016 at Olympia London, showcasing Mirri. Packaging Innovations is a celebration of all things packaging, where 170 professionals and suppliers shared the latest trends and innovative solutions; launching hundreds of new products! With exciting seminar content, engaging show features and great networking opportunities, Packaging Innovations was much more than just an exhibition. The team enjoyed discussing the use of Mirri on luxury retail packaging and on POS display packaging, and sharing knowledge of how it can be applied in many different ways with Mirri Bespoke options. Whether clients want the ‘less is more look’ as favoured by Ann Dunne from Harrods, or instead prefer to embrace the wonder of Mirri Sparkle, we enjoyed navigating brands, printers and packaging designers through the wonderful world of Mirri and its diverse uses. What was new from us? This subtle form of Mirri is stripped back, stylish and contemporary. When overprinted, this white board offers a subtle shimmer effect, either with an all over pearl effect or multi-coloured prism lines across the sheet. There is also a completely white gloss product available within the Mirri Blanco range. These were the show stopper for us, and their first outing didn’t fail to impress. Capturing the imagination of a shopper who has invested in a luxury purchase, the box looks like an ordinary brown cardboard box from the outside (ideal for e-commerce) but inside lies a treat – they are lined with eye-catching Mirri for a luxurious unboxing experience! This product has been developed on the back of a project we are working on for a luxury retail brand, and the interest at the show tells us this one could be tempting many more retail packaging designers in the very near future. This is a fun, tactile addition to our product range. Mirri Lens is a bespoke lens design product, achieved through the lamination of micro-embossed fresnel lens film to the face of high quality boards and papers. It provides a premium, luxury product for high-end carton applications such as perfume and cosmetics, travel retail and gift markets. Old favourites included Mirri Sparkle which as ever attracted a lot of attention! Visitors were able to ask our team first-hand about our Mirri Bespoke offering, which allows customers to order Mirri in a variety of weights and sizes to suit their requirements. Our striking stand backdrop was printed on Mirri Holographic Rainbow, on our in-house large-format Roland DG printer. Designed by The Bigger Boat, the inspiration came from the circles on the Mirri logo. The circles became a graphic language used throughout the artwork to communicate Mirri techniques and to show how Mirri interacts with print. 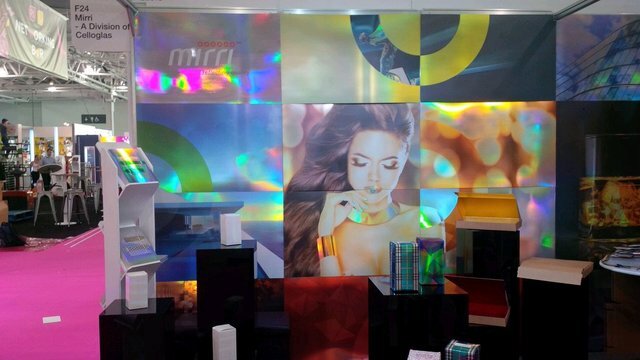 At the stand, we gave away a Mirri poster which was litho printed on Mirri Holographic Rainbow paper, and leaflets which were printed on Mirri Pak for HP Indigo. If you’d like a trial of your packaging design printed on Mirri on our in-house Roland DG printer, please contact us. We hope to see you at Packaging Innovations 2017, where we’ll be exhibiting as part of Luxury Packaging for the first time!